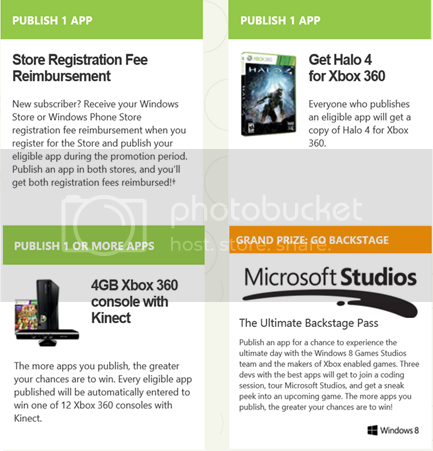 · A Store registration reimbursement* AND a FREE copy of Halo 4 for Xbox 360! · A chance to win one of 12 Xbox 360 consoles with Kinect. The more apps you enter, the more chances you'll have to win. · The Grand Prize: Three devs with the best apps will win an ultimate backstage pass to Microsoft Studios and spend the day with the Windows 8 Games Studios team—makers of Windows 8, Windows Phone 8 and XBOX-enabled games! · Additional Benefit for GameSalad Customers: 5 Apps Will be Chosen by Microsoft and GameSalad to be highlighted on ‘Hot Apps, Cool Dev’ site. We can help you launch your app. Either create a new app that you have been building or contemplating for some time, or simply convert an existing app that you built for IOS and/or Android platforms. Store Registration Reimbursement Terms: Current Windows Store and Windows Phone Store subscribers, members of DreamSpark, BizSpark, or MSDN are not eligible. Reimbursement will be awarded in the form of a Gift Card ($49 for Windows Store or $99 for Windows Phone Store). Limit one (1) reimbursement per Store per person. For full details, eligibility, and entry deadlines, see Official Rules. Participation is US Only. Below is a summary. READ THE FULL Terms and Conditions for all the details. · While there is no limit to the number of apps you can submit in this promotion, each app you submit to a single platform must be substantially unique and different. If you publish one (1) specific app on both platforms, you will receive two (2) entries. Judging Criteria for the Ultimate Experience. 25.00% - Does the app include platform specific features: Live Tiles*, Snap View, Share, and Search? 25.00% - Does the app have market potential given current application trends? 25.00% - Does the app conform to the Windows Experience and UI guidelines? Information provided through this is very helpful. Whatever happened with this? I submitted my app and seemed to be accepted and now the whole thing has disappeared and replaced with a different offer. I've never been contacted about my submission. What happened? I got an email that I will receive a the Halo Game for xbox. But never did.